The educational app acclaimed by parents, teachers, and critics alike has returned. Bugs and Buttons 2 seeks once again to entertain and educate youngsters and it does that exceptionally. 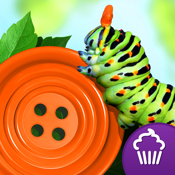 Whether you are familiar with the original Bugs and Buttons or not, this is a must-have app for any child out there. Bugs and Buttons 2 takes everything that users love about the original and brings a whole lot more to the table this time around. First off the graphics in Bugs or Buttons 2 push the limit on any kids app I've seen thus far. Even on the small screen of an iPhone the texture of the insects, buttons, and background are comparable to a next gen-console; it's nothing short of impressive. The goal of Bugs and Buttons 2 is to teach children critical learning skills such as counting, sorting, pinching, balance, and many more. By utilizing two separate modes of gameplay and over 10 different levels to try, the chance of your kid getting bored while playing this are slim to none. The controls in both game modes work flawlessly no matter if you're sorting falling buttons into their respective bins, keeping the bugs from ruining your picnic, or any of the other engaging styles of gameplay. Yu will see no lag in the game itself or a missed tap or swipe by the interface. If your child is having issues understanding how each level works, simply tap the pause icon and in the menu select Instructions. A quick image-based tutorial will give you all the ins and outs of what the task is and your child will soon be back to playing. If you are afraid some of the games may be a little too easy for your child, don't fret, because the game itself gears the difficulty to your performance in each round. I encourage parents to test this out to see what I mean: even though the tasks may seem basic to us within moments you will find yourself engaged in the gameplay as the speed and difficulty increases to your level. This will ensure the game will be challenging to your child regardless of age or familiarity of gaming on an iOS device. Bugs and Buttons 2 is not only a great sequel to a critically acclaimed app, it surpasses the original by leaps and bounds. If your child is a fan of the original Bugs and Buttons I'm sure this latest edition is already on your radar; if not, it should be. If your child has never tried a game of this type I implore you to download this immediately. Not only is fun to look at and play, but it teaches critical thinking in such an incredible way.